Many dermcidin derivatives exhibit broad-spectrum antimicrobial properties, with the most abundant species exhibiting antimicrobial activity in the human sweat being DCD-1 and DCD-1L. Both DCD-1 and DCD-1L have been shown to exhibit antimicrobial activity against both gram positive bacteria and gram negative bacteria. Notably different from the typical behavior of most AMPs, both DCD-1 and DCD-1L embody a negative net charge and their antimicrobial activity has been reported to be maintained over a wide pH and salt concentration range. These discrepancies in the behavior of dermcidin derivatives give merit to the hypothesis that the mechanism of action of DCD-1L may differ from other charged, mostly cationic, AMPs. While the main suggested mechanism of action for the DCD-1L peptide appears to be insertion into the bacterial phospholipid membrane and subsequent pore formation, studies have indicated that dermcidin derivatives also effectively disturb bacterial macromolecular synthesis. It is widely acknowledged that a protein's three dimensional conformation largely dictates its activity and that this conformation is largely encoded into the protein's primary structure. Previously, there have been some conformational studies of dermcidin and its derivative peptides. However, these have been largely limited to protein secondary structure promoting solvent environments, such as trifluoroethanol (TFE), and environments aiming to mimic the bacterial cell membrane. It is like discovering Penicillin..... we set out to establish trends in peptide behavior and ended up with a new mechanism for antimicrobial activity. Here, we examine the behavior of DCD-1L in aqueous, low salt solvent environments through the application of molecular dynamics simulation. We use a well-documented and widely used united atom force field to describe the structure and interactions of the molecules. Based on the calculated trajectories, we characterize the behavior of DCD-1L in range of varying salt concentrations and temperatures. 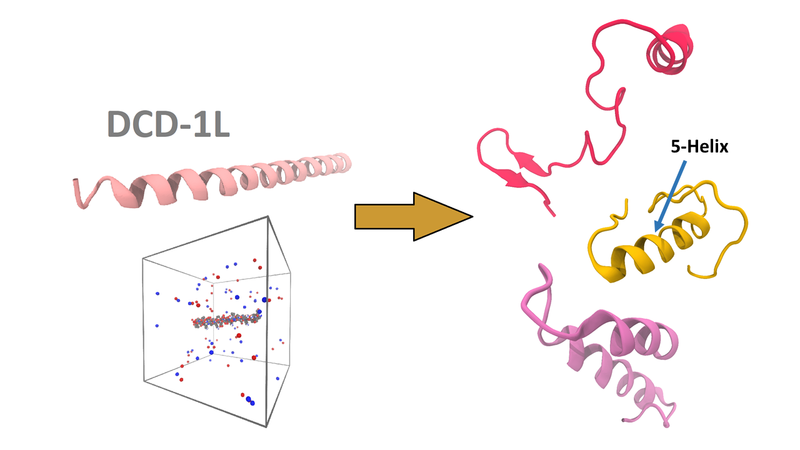 We observe the evolution of the peptide three dimensional conformation as a function of simulation time, salt concentration and temperature, emphasizing the development of secondary structure in terms of retention of antimicrobial functionality. Initially, we set out to establish trends in peptide behavior and retention of antimicrobial function in water for use in designing our end product: a cellulose based hydrogel which you can read more about here. Based on our results, we find that the helicity of DCD-1L is mostly lost in favour of a random coil conformation. In the cases where helicity is retained, we find that the first half of the peptide assumes a rare 5-helical secondary structure that is often incorrectly characterized using experimental methods. We postulate that the retention of helicity in the locally cationic first half of DCD-1L could in part explain the retention of the peptide's antimicrobial activity in water. This specific region of the peptide has been hypothesized to play an important role in the initial interaction between DCD-1L and the negatively charged bacterial cell membrane. Figure 1. We used molecular dynamics modeling to probe the behavior of DCD-1L in different solvent environments.